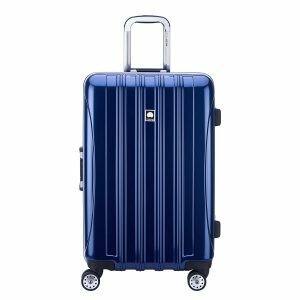 Delsey Paris Aero Frame is an expandable spinner hardshell 25-inch suitcase with a beautiful modern appearance and a very sturdy build. It is rated 4.4 out of 5 stars by 529 customers on the day of this review, indicating high levels of customer satisfaction. You have eight colors to choose from, blue, silver, titanium, peony, cobalt blue, plum, brushed charcoal, and brick red. It looks nice and sleek no matter what color you choose, is not a cheap or cheaply made luggage and is designed to last a long time made of solid and robust material. You’ll find four spinner wheels that rotate smoothly 360 degrees and ensure mobility on different grounds. It includes the side and top carry handles that let you lift the bag comfortably, as well as a sturdy telescoping handle. You have the tie down straps on one side of the interior that tighten nicely, so your packed stuff does not move as much. Delsey Aero is lightweight, weighs just about 8 pounds and measures 10.8 x 18 x 27.5 inches including the wheels. So 25-inch height is when you measure just the body, without the wheels. 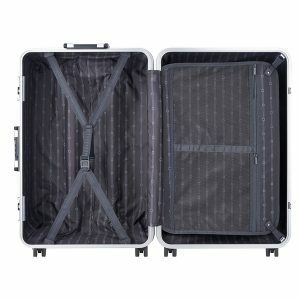 This luggage is lightweight but please don’t expect it to be as light as a soft-shell fabric luggage. You can easily fit in one to two weeks’ worth of clothes if you pack it carefully. And it is also small enough to take with you when you’re away for just a few days. We reviewed the Delsey Titanium Luggage before and this one has the more sturdy wheels and not extend out as much as the Titanium wheels. You can pack the Aero, like other traditional suitcases as it opens up like a clamshell whereas the packing of Titanium is different, you pack it like a book. The 25” Aero is too big for being used as a carry-on bag, it won’t fit in the overhead locker on the plane and you need to check it in before your flight. It is waterproof and no rain will get into the luggage and the contents will be protected when left outside at the airport. If you travel frequently for work or leisure the Delsey Aero will hold up very well as it is built resistant to abuse and impact but can scratch easily too. A couple of customers complained about the bad smell but it goes away after a few days if you leave it outside. It has the expansion ability but opening the secondary zipper right next to the main zipper giving you an extra inch more depth. And after packing it tightly with clothes closing it will not be a problem. The lock comes preset to 0-0-0 and there is an information booklet in the box and you’ll find the instructions for setting the lock to your preferred digits. The exterior is hardshell but smooth and flexible, feels more like a tough plastic and keeps its shape completely. The warranty offered by Delsey Paris Inc. is 10 years limited and good customer support when you need it. It looks pretty, has a sturdy and durable build, is expandable, has solid spinner wheels and offers great value for money overall.